Whenever you and the Runner reveal secretly spent credits, gain 1credit. But it's so simple. All I have to do is divine from what I know of you: are you the sort of man who would spend zero, or one credit? Now, a clever man would spend nothing, because he would know that only a great fool would reach for what he was given. I am not a great fool, so I can clearly not choose zero. But you must have known I was not a great fool, you would have counted on it, so I can clearly not choose one credit. Because your credits come from Account Siphon, as everyone knows, and Account Siphon is intended to be played with criminals, and criminals are used to having people not trust them, as you are not trusted by me, so I can clearly not choose zero credits. You've beaten my Lotus Field, which means you're exceptionally strong, so you could've spent no credits, trusting on your strength to save you, so I can clearly not choose zero credits. But, you've also bested my Caprice, which means you must have studied, and in studying you must have learned that man is mortal, so you would have put the credits as far from yourself as possible, so I can clearly not pick one credit. IT HAS WORKED! YOU'VE GIVEN EVERYTHING AWAY! I KNOW WHAT YOU'VE SPENT! You only think I guessed wrong! That's what's so funny! I chose two credits when your back was turned! "Never go in against Jinteki when death is on the line"! Nisei Division is just not very good. There, I said it. But it's worth discussing why it's not very good, and thinking about maybe what it would need to become decent. Any discussion of Nisei Division needs to start with a discussion of the psi game. Each player secretly and simultaneously spends 0, 1, or 2 credits. I'm going to repeat that, with added emphasis: each player secretly and simultaneously spends 0, 1, or 2 credits. This is crucial to the function of the game--the players are not simply choosing random numbers, because in Netrunner, every single credit matters. So, spending less money is better than spending more money, all other things being equal. At the same time, though, the benefits of winning the psi game (or the penalty for losing) is typically so huge that it is worth the extra cost, if it works. This leads us to a strange situation, something vaguely similar to the Battle of Wits scene from The Princess Bride, with one crucial distinction--the corp has to make the values different, which is much easier than making the runner's task of making the values the same, giving an edge to the corp. However. In some cases, the runner might be able to trigger the psi game repeatedly, or the penalty for losing might not be particularly severe--taking 1 brain damage from a Cerebral Cast, losing an early run to Snowflake, or letting the corp hold onto The Future Perfect when they don't have a scoring remote are all places where the runner can afford to lose the psi game. In this situation, an experienced runner will almost always bid 0--if the corp bids 0, they win, and if the corp spends 1 or 2 credits, they've at least forced the corp to burn resources. This is where Nisei Division is theoretically advantageous. Now, instead of losing 2, 1, or 0 credits from a psi game, the corp might lose 1, break even, or gain 1 credit. Suddenly, the "always bid 0" runner tactic doesn't work, because the corp can always spend 1 (because they get it back), winning the psi game without cost. Betting randomly makes some sense now-- Nisei Division will break even in credits in the long term, while the runner will lose a credit per game on average. This means that Nisei can afford to play a lot more psi game cards. Snowflake? Put in three of them. Cerebral Cast? Why not, put in a couple. Clairvoyant Monitor? No, that one is still pretty much terrible, leave it in the binder next to Bullfrog. And of course, the classic Jinteki cards The Future Perfect. Caprice Nisei, and Marcus Batty. The problem is that this doesn't lead to any sort of real strategy. Cerebral Cast needs Scorched Earth to make both the brain damage and tag painful, but Caprice Nisei does nothing to help a kill strategy. Even if they break it every time, Snowflake is just a slightly cheaper Wall of Static, and there's not much point in using Marcus Batty to trigger an "end the run, maybe" subroutine. 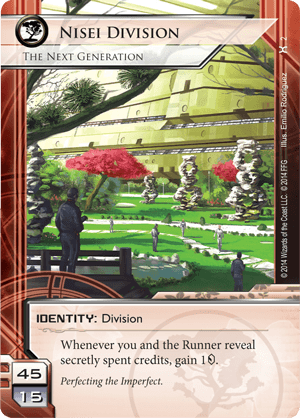 And because there aren't enough psi game cards to fill a deck, any Nisei Division deck will need to start pulling in cards that would fit better in Personal Evolution or Replicating Perfection--and at that point you might as well just play one of those IDs instead. For Nisei Division to be able to stand up as a decent ID, there need to be more psi game cards, cards which trigger psi games more than once, and they need to have some internal synergy. That could happen--but I sincerely hope it does not, because reducing the outcome of every match to "who plays psi games better" would be a sad thing to happen to this game. I think it's about time that we revisit Nisei. I love Parzifal's flavor review, but it's been nearly two years since the last substantial review. And said review is excellent--it hits on a lot of the difficulties that Nisei faces. It's sort of an Econ ID, but not a substantial one. It supports a play style that is chancy and porous. However, some newer Psi cards have come out to support the ID (Hyoubu Research Facility, Mind Game, and Fumiko Yamamori, to name a few). Rather than dispute what tiedyedvortex claims, I'd like to offer a different approach. Some corp IDs rely on advantage through economic denial, rather than their own gain. Spark Agency: Worldswide Reach and Gagarin Deep Space: Expanding the Horizon are excellent examples of this play style. I may not gain as much money as a turn one Oversight AI Curtain Wall in Blue Sun: Powering the Future, but I can make you hurt. I think Nisei is another (janky) version of econ denial. Why is that? Because every time you fire a Psi game, money is being spent. Your job as the Corp is to make sure they are too poor to do what they want to do. Nisei accomplishes this by forcing taxes on nearly every subroutine and upgrade. Don't think of Psi Games as some random, uninteractive, "I'll roll a D6 to decide how much to spend". As a matter of fact, tell the runner "I'm spending 2 on this Snowflake; if you match me, you won't have enough to get through my Caprice Nisei, second Marcus Batty, AND spend the 2 to steal Fetal AI. NAPD Contract is also an excellent addition to the deck. Granted, the Corp has to spend money too; there's the rub. Good econ is necessary to keep the deck going. On top of that, how do you deal with a rich runner? In today's meta, Temüjin Contract, Daily Casts, Liberated Account, or the newly released Bloo Moose (I could go on) will keep the runner quite healthy. As a matter of fact, they are highly unlikely to be too poor to ever completely be locked out. But that's the Jinteki way; embrace it. The trick to Nisei is that the other half of your deck is a classic shell game. Throw in your Project Junebugs, your Ronins; even dust off your Edge of World. Why? Stacking ICE deep on a server is a huge tell. It means, "hey, I want to score. Stay the hell away." But with Psi ICE, it's all porous. Let the runner think he's accomplishing the impossible by demolishing a 4-ICE server for that juicy agenda you IAAed last turn--only it's a trap. Naked ambushes arouse suspicion; but guarded too heavily, they may not be accessed in time. Psi ICE confuses the signals of scoring server and well-laid trap. Adding these ambushes aids your Dedicated Neural Net when they stay in HQ; scoring one of these can turn a HQ run into a dead run, or even a flatline. The runners death can be outside HQ as well; a total Psi flatline condition now exists, according to the FAQ: Fumiko Yamamori triggers AFTER Psychic Field. Thus, they lose all cards in grip, then take the meat damage from Ms. Yamamori. I won't say it'll ever be top tier. And Psi games can exacerbate the variance inherent in Netrunner. But I think the support has arrived for what remains to be a game of hidden stakes, bluffs, and game-deciding calls.